I bet you didn't know that its the Singapore International Water Week! Cos I didn't too... Until I received an invitation to attend a roundtable discussion held at MBS! This event usually only involves key players in the industry so I was extremely thrilled to see what its like! is the global platform for sharing and creating innovative water solutions. SIWW delivers a range of flagship programmes where global water industry players share the latest in business and technological innovations, as well as policy developments in water. Water is the genesis of life, if there was no water there would be no life. With rapid population growth, expanding urbanisation and increasing industrialisation, threats to water security and sustainability have never been more real, at the discussion, several key players of the industry came together to share their views on how to discuss issues relating to ensuring water security and cost competitiveness, and understanding water as a social, environmental and economic asset. Two solutions that were strongly discussed throughout the session was proper pricing and good management. His Excellency, Jose Angel Guria mentioned that with no cost on water, there will be no awareness on the value which will result in a waste of the resources. Countries like India and Mexico have plenty of water but are taken for granted. Prof Asit Biswas, who was the Roundtable Chairperson added in his closing speech that with good management, water scarcity can be improved. Using India as an example, he mentioned that they never had a minister who was capable enough to manage her utilities or stayed long enough to come up with a plan to see its implementations. Several of the speakers also gave in good words about Singapore's water management and government policies which made me feel thankful to be living here, in this beautiful city. 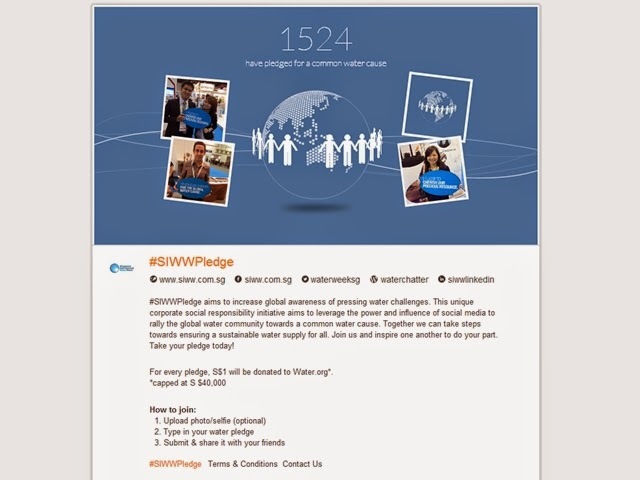 The SIWWPledge aims to increase global awareness of water challenges. This initiative aims to the global water community towards a common water cause. Simply click on "Pledge Here" to start! There is 1524 pledges made right now, and we have 38,476 more pledges to go!